After Intel's introduction of a consumer PCI-Express chipset earlier this year, many people have been wondering when, where and how AMD will announce PCI-E, since AMD doesn't make its own chipsets in the same way Intel does. You can all cease worrying, because first to the line is VIA with their K8T890 northbridge and VT8251 southbridge that we are looking at today. PCI Express is a serial based technology that allows for increased bus speeds, with fewer wires, than existing PCI technology which has hit its performance limitation of a 133Mbit/s shared bus. PCI-E was conjured in order to cope with the demands of high data rate applications like streaming high definition audio and video, gigabit Ethernet and next generation graphics cards. Current, consumer motherboards will offer PCI-E x1 slots and x16 slots with servers offering additional slots of x4 and x8. The x1 slots will eventually completely replace the standard PCI slots. They can provide a bidirectional (both upstream and downstream) data rate of up to 500Mbit/s - that's 4 times the bandwidth of standard PCI. The x16 PCI-E (or PEG: PCI Express Graphics) slot is a replacement for AGP and provides a bidirectional data rate of up to 4GBit/s. Whilst the Athlon XP will never recieve support for PCI-E x16 slots, it may recieve support for two PCI-E x1 lanes, should motherboard manufacturers see it as being viable. 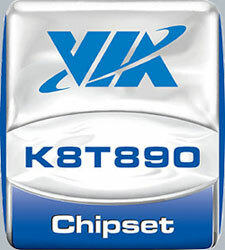 VIA's K8T890 northbridge solution only supports the Sempron, Opteron and Athlon 64 processors. The K8T890 enables x16 PEG and 4 x1 PCI-E connections as well as a full speed HyperTransport link to the CPU. VIA DriveStation: 2 standard ATA133 ports support up to 4 IDE devices, as well as 4 SATA ports supporting RAID 0,1 and 0+1. The chipset also supports native command queueing over SATA. VIA Vinyl Audio: High definition, 8 channel, 192Khz/24bit for audio of the highest standard. VIA Connectivity: 8 USB 2 ports, 2 PCI-E x1 connections, Gigabit and 10/100 Ethernet, MC97 as well as legacy ports. The chipset is pin compatible with previous generations to allow mainboard manufacturers to easily integrate it. In addition, you get the usual unified driver set of VIA Hyperion.